We are offering our clients Sarod. Manufactured using superior quality tun wood, our offered sarod is durable and is resistant to termites. 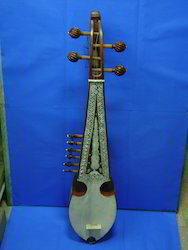 This stringed musical instrument is widely appreciated for introspective sound.We are the leading manufacturer and exporter of sarod.Courrier charge extra.Packing- In hard box. - 23 Strings including drone notes. We are amongst the most reputed names in the industry, offering Sarod. Our firm is presenting an extensive range of Banjira Sarod. Furthermore, we present this range to our customers at nominal prices. Seasoned tun wood, 8 top strings, 2 chikari and 15 sympathetic strings. extra brass gourd fitted. Professional quality. back & sides highly polished, fine quality leather on top with pure steel chrome platted fingerboard, rosewood pegs, 21 strings with extra tumbi (made of wood or metal) on top, full size. We are engaged in offering Sarod. We are a top-notch organization, engaged in providing Sarod. A special Miniature version of the Sarod is being offered by us. Our mini sarods are replica versions of stringed sarod, which is played throughout India, Bangladesh and Pakistan. This is a miniature instrument for decorative purpose only. Standard Size, Fancy Work, with Side Tumba Best Qlty. Made from well seasoned Tun wood. The best quality Goat skin is mounted on the sound chamber for concert sound and tone.Fitted with lotus shaped tuning pegs and a special chrome-plated finger board with fine craftsmanship.String Combination: 10 Main strings and 15 Tarab strings.